In Ontario, many employers use a ninety (90) day probationary period to determine whether a new employee who was just hired is suitable for the job. A common perception is that if a new employee is terminated within the probationary period, the employer may terminate said employee without providing any notice or pay in lieu of notice. This perception may stem from the fact that pursuant to the Ontario Employment Standards Act, employees with less than three (3) months of service are not entitled to any notice of termination or pay in lieu of notice. Simply put, just because an employee is terminated within this time frame does not mean that they are entitled to nothing by way of notice or pay in lieu of notice. 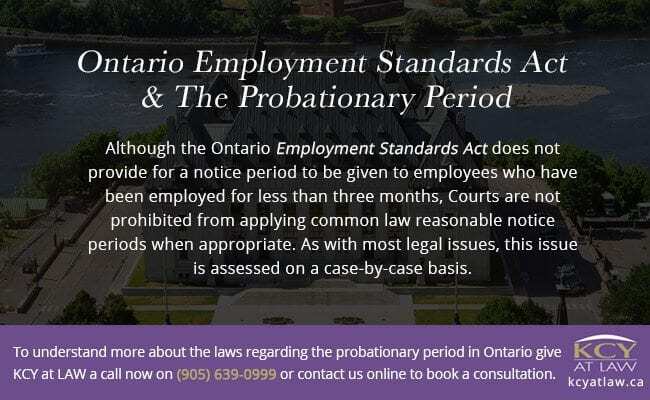 Although the Ontario Employment Standards Act does not provide for a notice period to be given to employees who have been employed for less than three months, Courts are not prohibited from applying common law reasonable notice periods when appropriate. As with most legal issues, this issue is assessed on a case-by-case basis. One potential factor that could influence a Court’s decision as to whether an employee dismissed within three (3) months of service is entitled to any compensation is whether or not the employee signed an employment agreement with a probationary period clause. More specifically, the contract may state that employees dismissed within the probationary period are not entitled to any notice of their termination or pay in lieu of notice. It may not be enough from an employer’s perspective for the contract to simply say that a probationary period is in place without reference to the employee’s entitlements following a termination within this period. Another factor to consider is the reason for the employee’s termination. For example, if the employee was terminated within the probationary period due to poor performance but there also happens to be an employee manual or handbook stating that employees would be given opportunities to improve poor performance (as was the case in the 2012 Small Claims Court decision of Cao v SBLR LLP), the Court may take the position that the employer is to follow their own policies. If an employer fails to honour its own policies, they may be at risk to be found acting in bad faith if they terminate the employee in this situation. Ultimately, it is important that both employees and employers recognize that it may not be enough to simply conclude that an employee who is terminated within the probationary period is precluded from any notice of pay in lieu of notice just by virtue of the contract referencing a probationary period. Additionally, there are various other issues and facts that could decide this issue in favour of either the employee or employer. 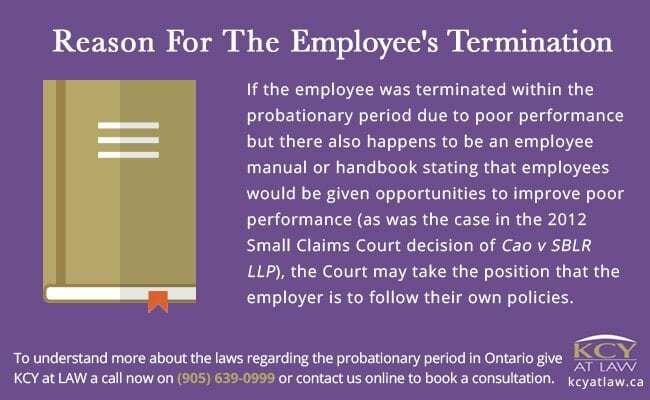 If you are an employer or employee involved in a situation regarding a probationary period and have questions, contact KCY at LAW right away at (905) 639-0999 or contact us online to book a consultation! https://www.kcyatlaw.ca/wp-content/uploads/2016/09/Terminated-Within-The-Probationary-Period.jpg 799 1198 Kathy Chittley-Young https://www.kcyatlaw.ca/wp-content/uploads/2018/01/KCY-at-LAW.svg Kathy Chittley-Young2016-09-14 21:05:272019-02-26 22:40:28Terminated Within The Probationary Period? Motor Vehicle Accident Lawsuits: What The Jury Does Not Know Can An Employee Rescind Their Resignation?